I think it's only fair that we start today with this absolute gem of an image. 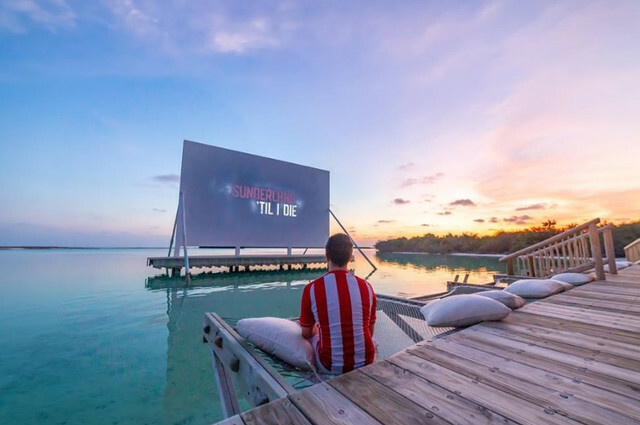 Posted by Matt Robinson on Twitter, it shows a quite incredible scene with Matt watching the Netflix series 'Sunderland 'Til I Die', projected on some monster board on a stretch of sublime water. Not sure if we will see a better snap relating to the documentary. I am one of the few Sunderland fans yet to complete the series, I'm on to episode four, taking it easy and in bitesize chunks. I fully expected this to be a series that only appealed to fans of the club, or those up the road who fancy a laugh, so it's really heartwarming to see how well it has been received by the wider audience. The Fulwell73 lads have done an amazing job opening up our wounds and showing them to the world in a way that grabs the attention of many, many fans who are affiliated no further than their own love of the game. And not make them laugh. Shipyards wonderfully portrays the region and to see it doing so well in the charts is yet another thing we can all take pride in. He's a good lad is Marty, and this is a great time to be a Sunderland fan (who'd have thought we'd be thinking this seven or eight months ago!). If you haven't downloaded it already - get yourself on ITunes, Spotify or Amazon Music and do it. Or do it on all of them. Away from Sunderland briefly, I know we shouldn't do this, but Jose Mourniho got sacked as depicted in the burytimes. Should we all laugh? Yes, yes we should, although the Premier League will be a duller place without him. Scouse-Mackem is quite the combination! It's good to see Power getting back into the swing of things at Sunderland after his disciplinary issues. He is a really important player for us, though the games played since his return have shown some hesitance in his play - he looks petrified at the prospect of another red. Play your own game mate, studs down and you'll be fine. He looks set to start again against Portsmouth, which is a game where Sunderland will not start as favourites - for once. However, if losing your money on football betting isn't your thing, perhaps you'd find some more success on slots and other games. Check out virgin games promo for a head start. Away from social media, this morning Roker Report have released another podcast with another unbelievable guest. Phil Bardsley is on, as the kings of Sunderland media continue to kill it with their pod guests, and this is definitely going to be one not to miss. And finally, some positive news for Charlie Wyke. He is targeting a return to action in Sunderlands bumper-attendance home game against Bradford (which, incredibly, looks like we might make 40k! 37598 reported as sold as of yesterday) on Boxing Day. It's a welcome return too, because he looks set to fall in love with Aidan McGeady's ability to deliver. One of the few weaknesses we have shown in attack this season is our ability to get physical. The likes of McGeady, Chris Maguire, Josh Maja, Lynden Gooch etc can't take on defenders physically, which was more evident than ever against Bristol Rovers - because their back line was tiny compared to what we usually see in this league. It's about time Wyke had the chance to prove the hype around his summer transfer was justified, and that he can add a new dimension to our charge for the League One title. Also, we'll be giving a couple of stuff away over the next week on social media, make sure you've got your eyes on our Twitter and Facebook pages.